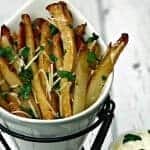 Air Fryer Parmesan Truffle Oil Fries are a low-fat, quick and easy recipe for crispy, crunchy french fries with parmesan cheese. 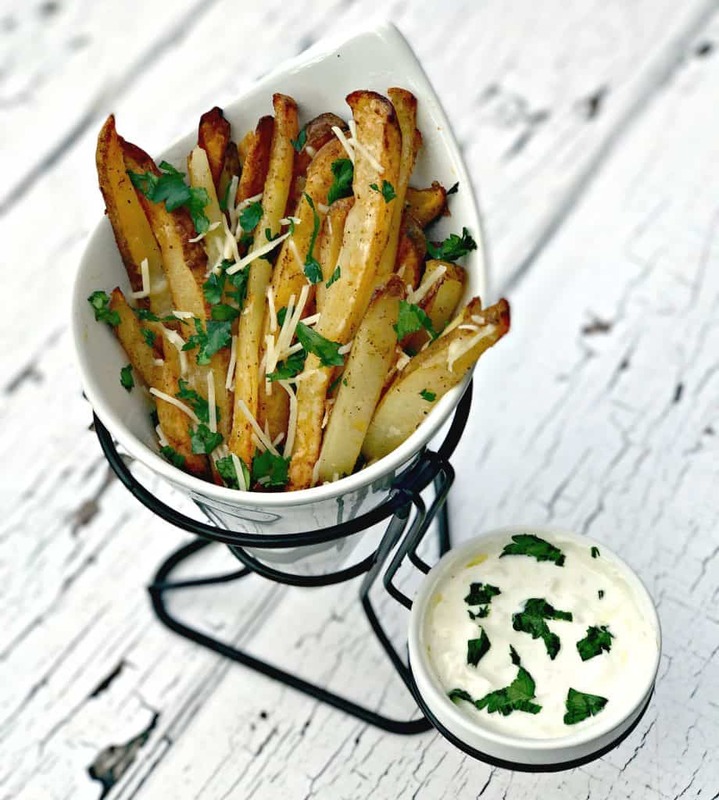 I paired these fries with my Low-Carb Truffle Oil Aioli for a dipping sauce. Be sure to check out the recipe! I love that I can set the timer on my Air Fryer and “forget” about what I am cooking for a small amount of time. I am huge on multitasking. While the fries were cooking I put things away and washed dishes. Cleaning up behind yourself is seriously the largest and perhaps, only, pitfall of cooking your own meals. These fries were everything I wanted them to be and more. I often order truffle fries while dining out. I am ecstatic that I can make them at home on my own, and save a ton of fat in the process by using an Air Fryer instead of a deep fryer. Place the sliced potatoes in a large bowl with cold water. Allow the potatoes to soak in the water for at least 30 minutes, preferably an hour. Spread the fries onto a flat surface and dry them completely with paper towels. Coat them with 1 tbsp of the white truffle oil and seasonings. Add half of the fries to the Air Fryer basket. Adjust the temperature to 380 degrees and cook for 15-20 minutes. Set a timer for 10 minutes and stop and shake the basket at the 10-minute mark (once). Use your judgment. If the fries need to be crisper, allow to cook for additional time. If the fries look crisp prior to 15 minutes, remove them. I cooked both of my batches for almost 20 minutes. When the first half finishes, cook the remaining half. Add the remaining truffle oil and parmesan to the fries immediately upon removing them from the Air Fryer. Top with shredded parsley. Serve! These look so delicious. I’ve never tried an Air Fryer or used truffle oil any of my cooking. I’m missing out on these truffle oil fries and need to add an Air Fryer to my kitchen inventory! 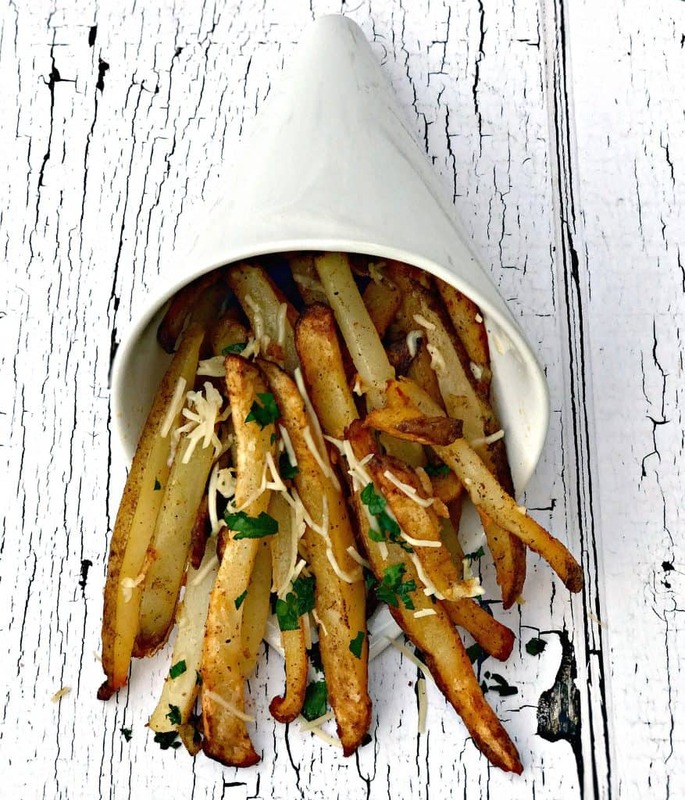 I’ve eaten truffle fries at restaurants, but now imagining serving these at home! These sound so good! 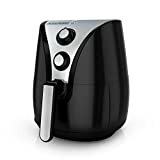 An Air Fryer has been on my wishlist since the start of the year, but I’m afraid it’ll just be one more gadget I don’t end up using, so I haven’t pulled the trigger yet. This recipe is making me wish I had one! White truffle oil in the air fryer sounds perfect! I’m definitely going to make these fries. I do have an air fryer right now and haven’t been displeased with anything I’ve made with it so far. It’s likely I’d use it more often if it could do larger batches. Okay you’re convincing me I need to get an air fryer. These fries look amazing! Nothing better than fries! These seem delish! I’ve been hearing about the Air Fryer. I think I need to add this to my wishlist. I’ve always wanted an Air Fryer!!! These look and sound absolutely delicious. I love truffle oil. I never thought to coat the potatoes first in an air fryer. I need to do that as mine always come out dry. I have had my eye on one of these for a while now. Every time I pour oil into a pan for fries I remind myself there is a healhtier way. 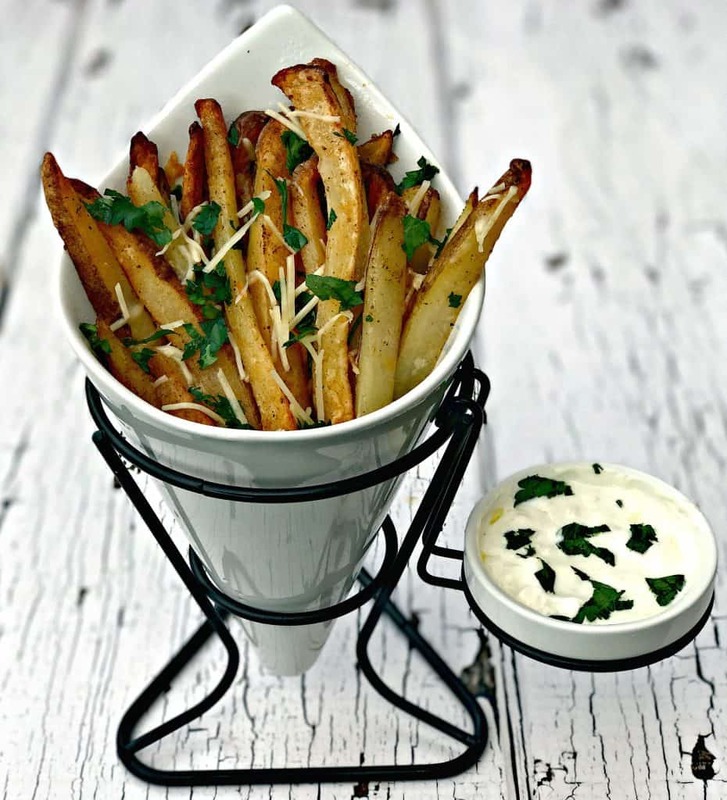 These look delicious I love truffle fries. Super easy to make I never thought to make them at home! These look like such an elevated way to eat fries. And making them in the Air Fryer makes them healthier! Now this is on my wish list for the holidays. I am already planning things to make in it. I have been wanting an air fryer for some time. One of these days I will get one! These fries look delicious! So glad I finished dinner as these look wonderful. Interesting ingredients & might try them one of these days. I have been wanting to an air-fryer for long now. Is it really that good..I love the way these fries look.. I don’t have air fryer but I am planning to buy on this Thanksgiving. Please share your air fryer details. I love the fries, it looks delicious. And that serving platter looks incredible. I have the Black and Decker displayed above with the photo. These look so good! 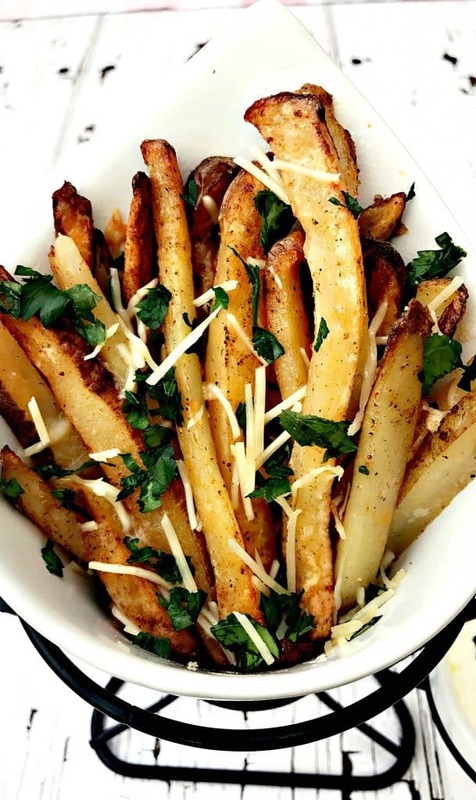 I make fries quite often, and I would love to try an air fryer.